This was a new one for me, a present I received last Christmas. I LOVE it and can't recommend it highly enough. The blurb says:"This formula combines a comprehensive array of studied technologies to target multiple signs of aging at once." See why I like it?! Apparently it's got all the identical fancy ingredients that appear in far more expensive products. Lots of their products are only £6 - the other one I love is hyaluronic acid. 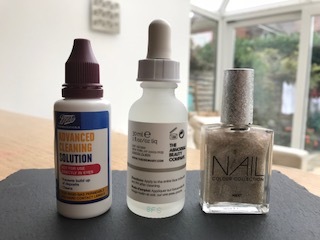 Buffet costs around £12.70 and you can get it in Fenwicks, so that means you also get to walk around with a fancy green bag too) I do feel that at 53 I'm finally getting my act together over skin care AND that my skin's looking good because of it - highly recommended! So that's it - today's purchases - 3 little bottles of joy. But you preach about vanity and run a food bank. Nearly £13 on a face product seems vain and a bit hypocritical to me.